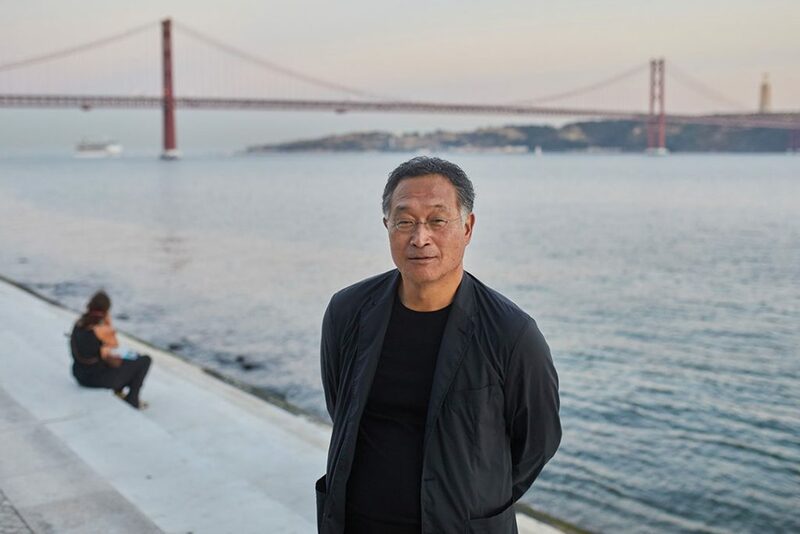 The immersive installation “Over Flow”, by Tadashi Kawamata, uses waste collected along the Portuguese coastline and can be seen at the Museum of Art, Architecture and Technology, in Lisbon. 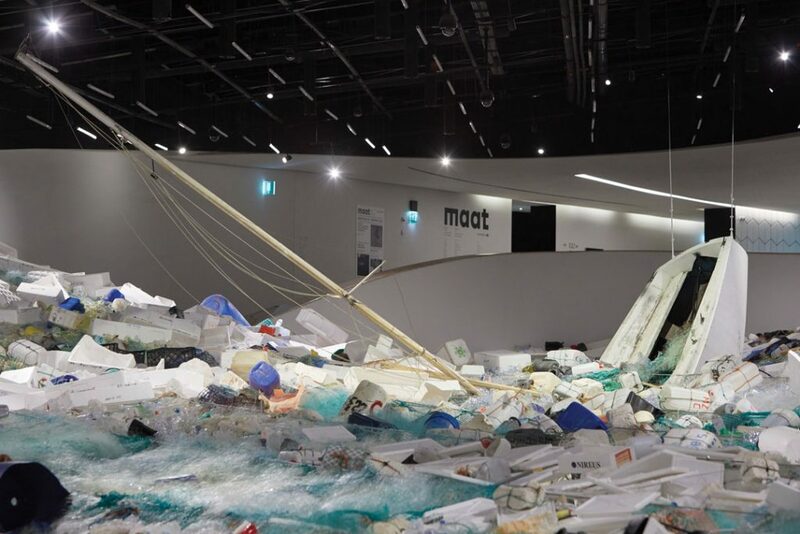 It could be adrift, or even sinking into the sea, but an abandoned boat appears to serve as an anchor to Tadashi Kawamata’s “Over Flow”, the wave of plastic waste which washed over the Oval Gallery at MAAT – Museum of Art, Architecture and Technology, in Lisbon. 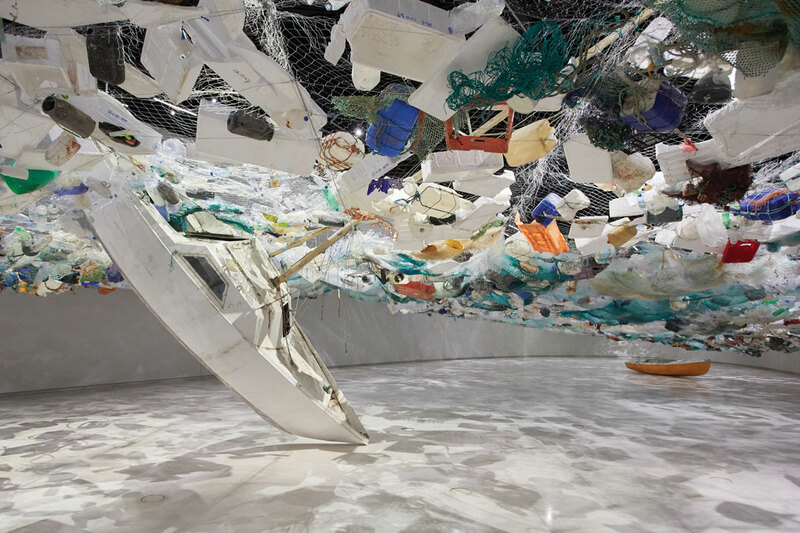 The sixth site-specific exhibition created by the Japanese artist for this space, following an invitation from the museum, brings up the consequences of disposable plastic to the marine ecosystem. 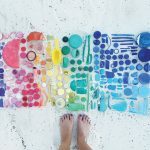 According to data from the European Union, plastic constitutes 85% of the waste found throughout the world’s beaches, and this exhibition challenges the visitor to reflect about excessive consumerism, waste and cataclysm. 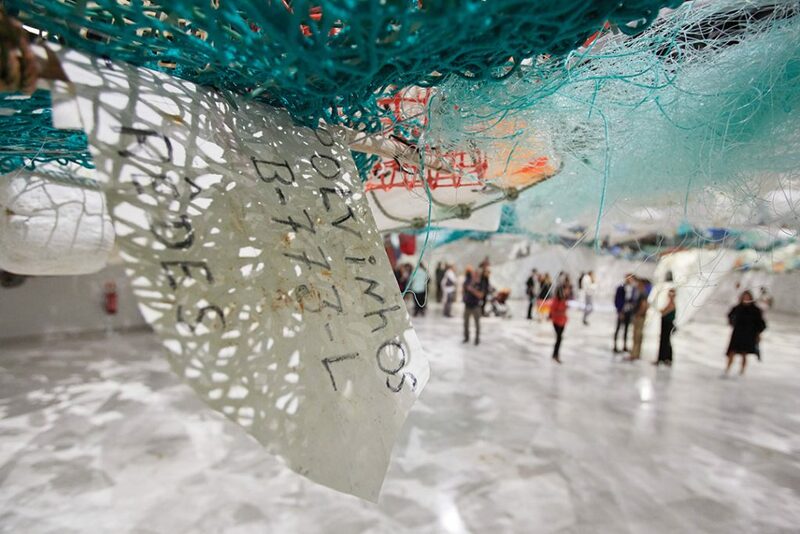 Entangled in fishing nets, all kinds of plastic waste, pieces of abandoned boats and cars, buoys and fishing traps are suspended until April 1, 2019 in this immersive art installation. With its nose turned downwards, an old vessel runs through – from top to bottom – an intricate web of marine waste collected by hand along the coastline of the outskirts of Lisbon, the bow touching the ground. There is an immediate impact upon walking into MAAT: a mass of plastic waste covers the museum’s Oval Gallery entirely, as if a giant wave had swallowed it in one gulp. At first glance, it looks like a nearly-smooth surface floating, an illusion compounded by the protruding stern and part of the mast of a boat, which insists on sinking in the space. A truly immersive effect is achieved by Tadashi Kawamata with the perspective from below the installation. Whoever walks down the museum’s ramp and under the surface of the sea – the waste wave – is no longer a mere spectator. 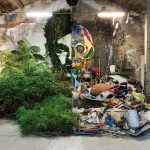 They are invited “to plunge into an evocation of an imagined seascape where, as if by the effect of a catastrophe, living beings have been replaced by the wreckage of human civilization”, as contextualized by Pedro Gadanho who, together with Marta Jecu, curated the exhibition. On being engulfed by this sculptural setting, it’s impossible to remain indifferent to the artist’s proposition. Hundreds of kilos of plastic lose their invisibility apparent upon the initial impact, as each detail in the exhibition takes shape before our eyes. The Japanese artist invites us to experience an environmental post-catastrophe marine landscape. Known the world over for the large-scale, site-specific and sustainable architectural landscapes he has been creating over the last three decades, with “Over Flow” the 65-year-old Japanese artist returns to the concepts of construction and destruction, to the use of recycled materials, to the transformation and reinterpretation of the museum space which have permeated his work. Developed over a year of research and field work carried out by the artist in Portugal, “Over Flow” challenges the visitor to experience a seascape following an imaginary environmental catastrophe where the detritus carried by the ocean have submerged civilisation. As Marta Jecu emphasises, in this installation “we are confronted with the strangeness of post-humanist landscapes and constructions”. 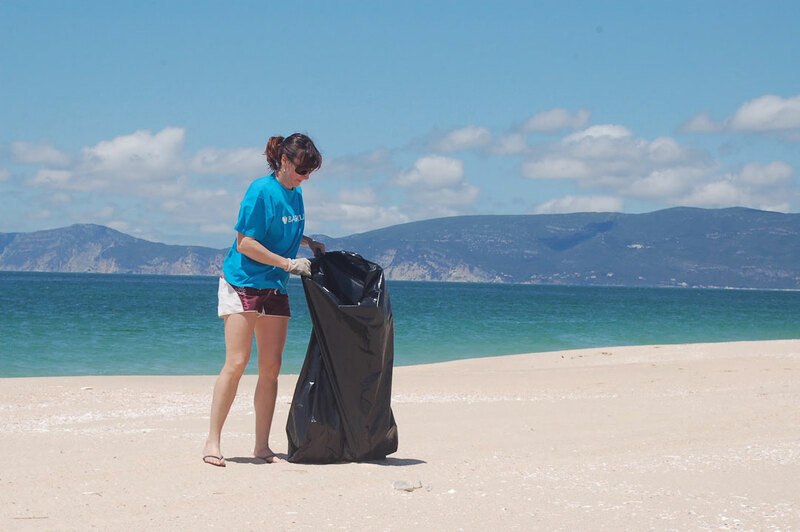 The process began with collecting plastic waste along the Portuguese coastline, led by Brigada do Mar (Sea Brigade), a voluntary organisation which regularly contributes to cleaning Portuguese beaches, in collaboration with Almada and Porto da Nazaré City Councils. 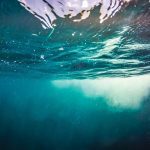 This waste clearing has enabled a better understanding of how waste travels globally through the oceans, because the Portuguese coast is increasingly becoming a destination for waste coming from other parts of the planet. Beach cleaning, environmental education, eco team-buildings and development cooperation are the areas of action of this environmental intervention project which, this year, celebrates its 10th anniversary. To mark the date, the Sea Brigade involved 400 volunteers of six nationalities in cleaning 45 kilometers of coast between Tróia and Melides for 15 days. 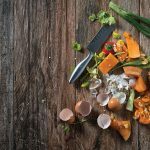 They collected 26 tonnes of garbage, mostly plastic, part of which can now be enjoyed in “Over Flow”. A workshop led by artists and architects, guided by the architectural collective Os Espacialistas and in collaboration with BoCA Summer School, made it possible to define the design and different modules which make up the exhibition – after intense research by the collective, and together with Kawamata – “from the hybrid compositions which the ocean and its movement and artificial components gradually produce from rejected waste”, the curator explains. Even though it only deals with waste from a perspective of potential reuse and integration into the artwork, and although the artist does not claim to be an environmentalist or a spokesperson for environmental causes, “Over Flow” shows the disruption caused by pollution in the marine ecosystem, the polluting elements which are clustered together by the perpetual motion of the oceans, as well as the effects of global tourism and its dramatic drain of natural resources. In this bottom-of-the-sea experience, and working in a city like Lisbon – which has already been destroyed once by an earthquake followed by a tsunami, in 1755 –, Kawamata also summons the old tradition of Japanese maritime prints, interspersing artistic and poetical references, such as “The Great Wave Off Kanagawa” (c. 1829-33), by Katsushika Hokusai. However, unlike classical prints, Kawamata’s wave does not depict nature as a threat, but rather “the way in which our current practices pose a devastating threat to the environment”, curator Pedro Gadanho emphasises. In fact, in this experience proposed by MAAT, we are instead confronted by the unnerving silence of a motionless territory, devoid of both human and animal species, emerging from Kawamata’s “Over Flow”: a scene of devastation where the remains of debris from the human civilisation alert us to the dangers of unbridled consumerism to the marine ecosystem. 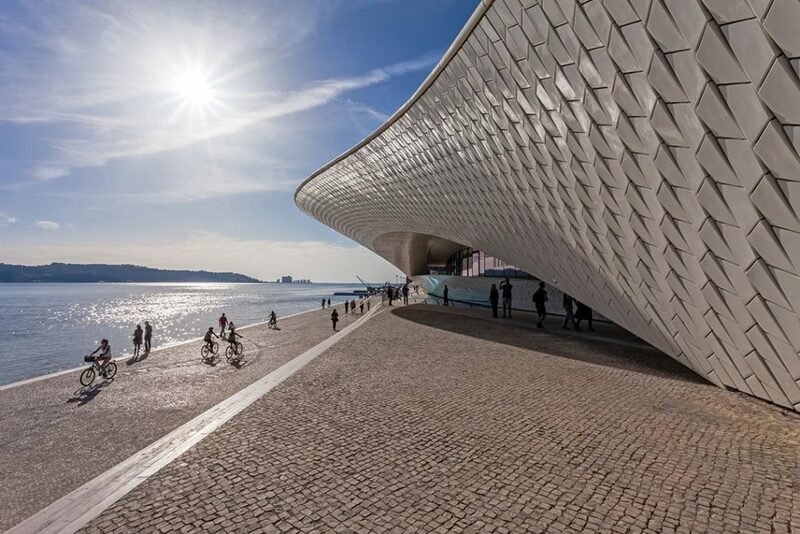 Presenting itself as a new cultural center in the city of Lisbon, the MAAT – Museum of Art, Architecture and Technology, opened its doors to the public on October 5, 2016, with the intent not only of being a space for debate, critical thinking and international dialogue, but also to revitalize the riverfront of Belém’s historic district. Nowadays, in an approximately 3,000 square-metre exhibitive space plus 7,000 square metres of public space, MAAT hosts national and international exhibitions with contributions from contemporary artists, architects and thinkers, through a diverse programme devised for all audiences and ages. Designed by the prestigious British architecture firm Amanda Levete Architects, the MAAT building is sensitive to both the city’s cultural heritage and future, offering, among other features, a pedestrian roof with a magnificent view over the Tagus river and the city. The museum’s cosmopolitan design coexists with the iconic Tejo Power Station, both connected by a landscape project designed by the Lebanese architect Vladimir Djurovic. With this 38 thousand square-meter campus, EDP Foundation – responsible for the museum – gave the city a unique leisure space.